For a user who loves new music or thinks his/her choice is good enough for the world to know and discover, this app is a must have. Its beautiful interface and delivery of the promised functions makes it a delight to use. The ingenuity of the application lies in the way it seamlessly connects the user to audiophiles in the vicinity and globally as well. 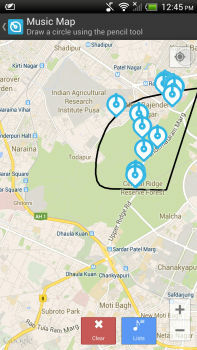 One can find and discover new music socially by following 'People' either suggested by the application or by drawing a circle on your vicinity map. 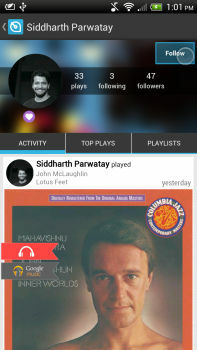 The app takes music exploration to a whole new level with localised trends that could also become global trends. 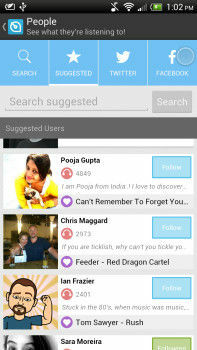 The app being a social media music finder, lets one link their Twitter and Facebook feeds as well. You can find your friends using the Search option and see what they are listening to and share your own playlists by integrating music players on your device. 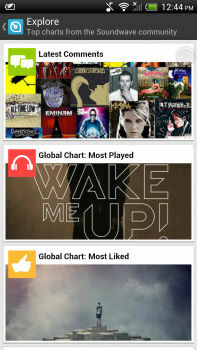 Soundwave boasts of a slick UI which is pleasing to the eye and looks excellent. The integration of all social accounts has been done seamlessly and is exclusive only for the purpose of music sharing. Once we began sharing actively, the Activity Feed filled up quickly . Thankfully, the app comes with four handy tabs at the top of the screen : By Plays, Ratings , Shares and innovatively titled 'Humdingers.' These categories help in filtering the fast cluttering feed. The user is also provided with the option of 'Guilty Pleasures' which disables all sharing and makes your music private.